Congratulations to TDSB student Cindy Tang, a student at Dr. Norman Bethune C.I. who has won the First Canadian Doodle 4 Google Canada contest. Her prize includes a $10,000 scholarship, a laptop computer and a $10,000 grant for her school. 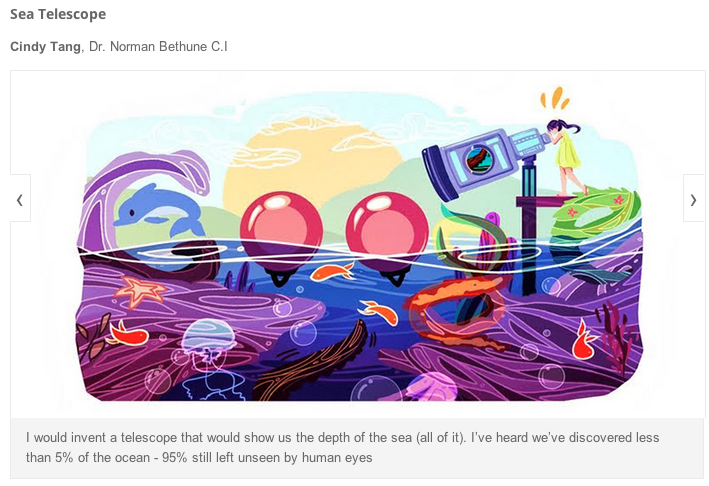 Her drawing, entitled Sea Telescope, was featured as the “Google Doodle” on the Google.ca homepage on Wednesday, February 26. It will also be part of a special exhibit at the ROM in March along with the images created by 72 other finalists.